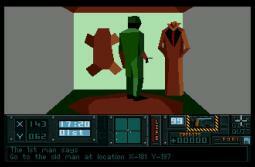 Either way, onto my review, Hunter on the Amiga 500, a great game, and a pioneer. Hunter is a game that takes you into a world where mayhem and destruction can reign free on your enemies and in whatever form that takes your fancy. 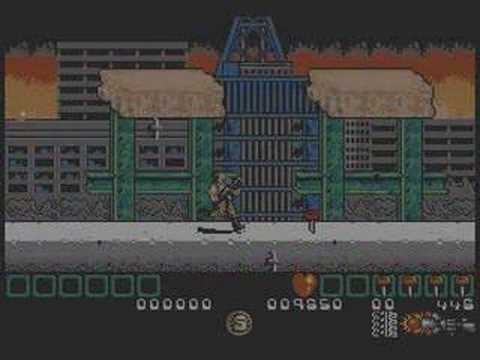 Having first played this on my Amiga I’ve been hooked ever since and it’s the main reason I’m a big fan of games such as GTA. Playing it through again brings back some great memories and is certainly a welcome addition to my games collection. 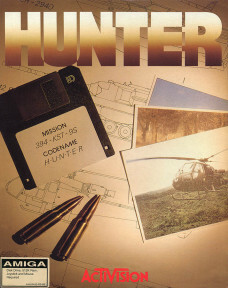 Hunter can be classed as a 3D action, adventure and strategy game, developed by Paul Holmes and Martin Walker (music) and released in 1991 by Activision. Hunter lets you play three different scenarios; MISSIONS, whereby you receive an objective and a deadline to complete it, once you have completed your mission you return to HQ to receive more orders. 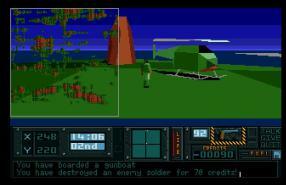 The objectives become subsequently harder and the time shorter to complete each mission. 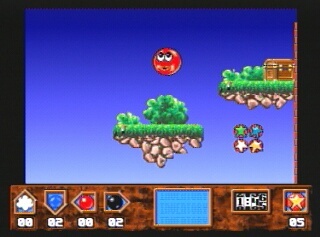 ACTION, your man in the field is given a long list of enemy targets, it is then up to you to use the map and log book to locate each target and destroy them. Once again you are racing against the clock to finish the list, but can destroy the targets in what ever order you like. Finally the main scenario, HUNTER, is the trickiest of them all. You must track down and kill the enemy General by collecting clues from civilians, bribing enemies, and by using a number of objects, vehicles and weapons to help you succeed. The deeper you go into enemy territory and the closer you come to completing this scenario the harder it gets, you are racing against the clock and options can become limited if you aren’t prepared for battle! The game is controlled via mouse and keyboard, or my preferred method mouse and joystick. The joystick controls the directional movement of your man as well as the stop and start in vehicles and moving them around (point to note, there is no reverse). The fire button is used for any form of attack, be it grenades, bazooka or your trusty pistol. The mouse comes into play with the strategy side to the game and is used in the selection of weapons and sundry items needed to progress (log book, flares, maps, weapons, money, food). Some of the most common items you will need to use are aerial observation units, parachutes, maps and radar, and the handiest item you can acquire is the enemy uniform (don’t go into your HQ wearing it though). 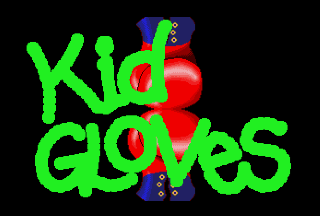 Both control methods are easy to utilise, and when using the mouse to select from the pop-up menu the game conveniently pauses. Hunter has great game play interlaced with simple graphics (as with many other great retro games) and makes the most of its sweeping landscapes and 3D environment. Greens, oranges and blues make up your basic air, land and sea colours, in turn making buildings, vehicles and people easy to identify. Vehicles are well drawn and conveniently placed at your disposal around the map, whether it’s a car, tank, helicopter or bicycle (less said about the windsurfer the better) you’ll be glad of the free ride as walking can be slow and tedious. Vehicles run smoother and faster than you would expect and each have their own unique uses (cars are nippy, tanks are slower, but can also take some serious missile damage). Helicopters are easy to fly after the initial trauma of take off but are a bugger to land, especially if in a rush, best to put down in a safe area and walk the rest of the way! The variety of weapons and sundry items is impressive. You can use a number of explosives to destroy targets or just have some fun generally blowing stuff up. 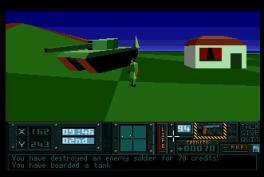 The player can use land and timed mines, sea to air missiles, bazookas, 80mm shells, grenades and all the while carrying your trusty sidearm. Aerial observation units and radar help you scope out and assess the landscape and can be useful in finding people, buildings and vehicles. The food and money collected is used to bribe and gather information and the enemy uniform to breeze into enemy territory without a care in the world. Helicopters. Fly, yes! Land, no! 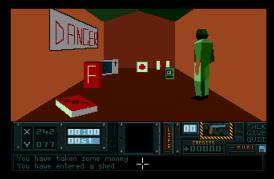 Apart from the title screen Hunter relies solely on sound effects to create its ambience. Across the landscape the player can hear gun fire, explosions and roaming vehicles, or a sultry seagull flying overhead, destined to make you its own special target (why else would it be following me…). The maps, a different one for each scenario, give the game a sense of vastness when you begin your mission, and in its quieter moments, especially when dusk has fallen (use flares to light the way, or turn the brightness up on the monitor), can be a little creepy and lonely without anything else around you. Hunter has few drawbacks, however walking everywhere will cost you time and time is of the essence in Hunter. Finding a vehicle can be crucial to success and sometimes its a long walk, so by the end you’ll be thankful for that enemy disguise, or the fact the soldier who arrived to work that morning forgot to lock his bike up to his guard tower. Danger! Random objects haphazardly strewn on floor! Hunter is a game (for its time obviously) with the freedom and almost limitless possibilities of any of today’s titles that fall into the sandbox genre (think GTA, but slower, and with simpler graphics). Hunter is a classic and still fantastic to play, its open environment and vast maps make it challenging, fun and atmospheric. This concluding sentence from Amiga Power (Aug 1991) really summed the game up for me and my own experience of playing the game back in the day. 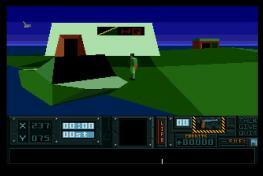 Jonathan Davies wrote in The Bottom Line “Hunter was a real all-rounder, there was something for everyone in there, all wrapped up in a believable 3D world you can get lost in for hours.” You can read the full review here on Amiga Magazine Rack. Home Sweet Home, a rabbit in every pot and a tank in every garage. Now, If you’ll indulge me a little longer, onto a more modern comparison. Far Cry 3 and Hunter both are set in an ‘open world’ environment and set across multiple islands, where the gamer can either play the linear story line, or just mess about as they see fit. You’ll come across friendly areas and characters, with ammo stores and resources to buy, alongside the clearly marked enemy territories and bad guys (even the enemies in Far Cry 3 are wearing red). A variety of vehicles are strewn around at your disposal, although as far as I can see there isn’t a hover craft or wind surfer in Far Cry 3… The comparisons in my opinion are pretty clear, Far Cry 3 ‘feels like’ Hunter, specifically from a game play point of view, right down to the ‘night and day’ effects and abundant wildlife in both games (although in Hunter you lose money for killing animals). In this gamers opinion, I think Far Cry 3 is what a modern version of Hunter would look like. A pretty bold statement, but maybe something to think about. The only music in the game comes from the title screen, listen to it here Hunter Main Theme. To give you an idea of the game play check out the first mission(in the MISSIONS scenario) being played out. This video is over 6 mins and just gives you a feel for the game play.